In today’s rather brief news from the Front, Begeren Colony is seeing an interesting development in Republic guilds. Various guilds have decided to form a “Guild Master Council,” a committee of sorts that consist of various members of large and influential guilds. Zaii’gal, the guild master of my current guild, the “Knights of Peace”, is one of the members recently asked to be on the Council. This Council is still slowly forming and getting organized, but hopefully we’ll see it improve over the coming months. All guilds involved may benefit from this union by the way of PvP, PvE, and of course, RP. More on this story as it develops. Tragedy has struck the Republic, and one of its’ heroes has recently fallen. 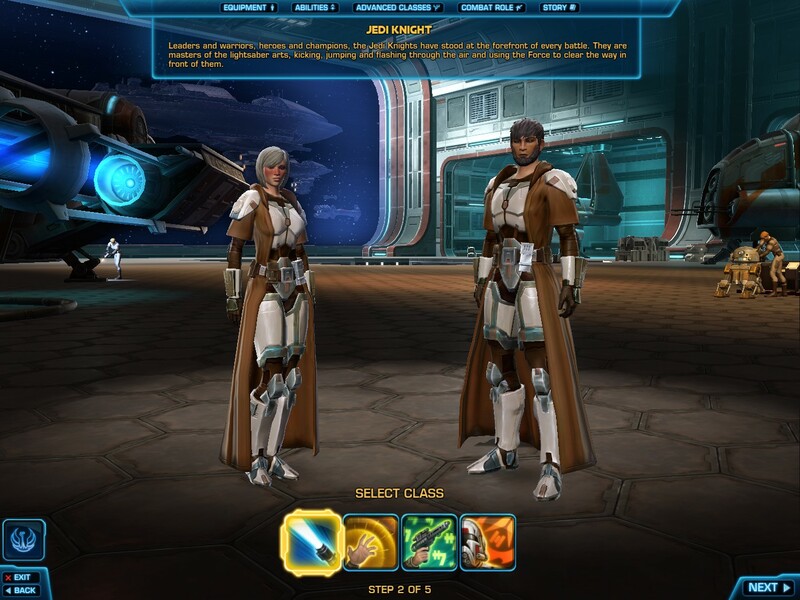 Master Va’an, a member of the Knights of Peace and loving husband of another member of the Republic, has passed away recently, both in the world of the Old Republic and the real world, and the news has only just been delivered to the Knights a week prior to this post. 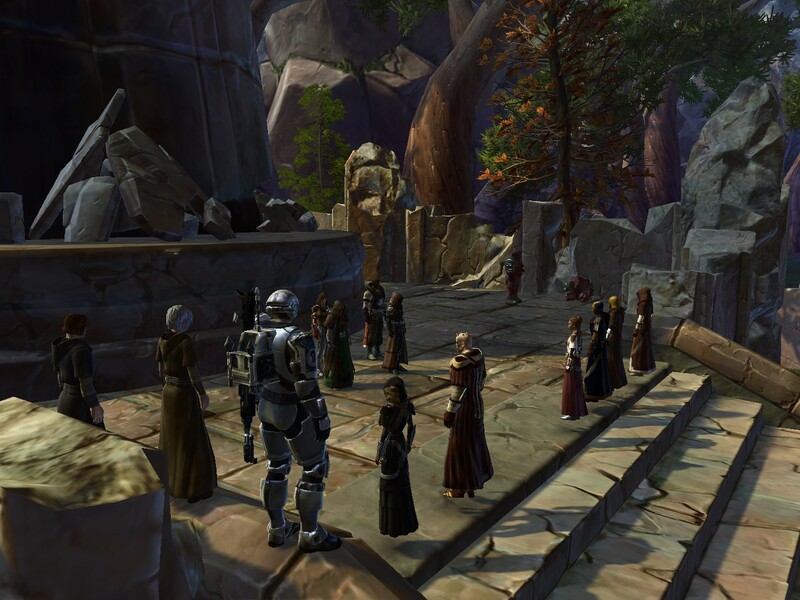 Shortly after a weekly meeting between the Knights of Peace and their members, friends of Va’an from the guild as well as former members of the guild held a service for the fallen hero on Tython. Guildmaster Zaii’gal, myself, and former Knights of Peace guildmate Kinzai gave speeches for the fallen hero, several other members of the Knights of Peace paid their respects, and the service ended with a SWTOR version of a 21-gun salute to send him off. Master Va’an was an eager roleplayer that rise, fell, and rose again from the temptations of the dark side, and he was an eager, enthusiastic, and friendly person. He is a true hero of the Republic, and he will be missed. Characters are the backbone of good roleplaying. It can take a bad character to ruin a good RP, but a great character can make any RP even better. The best characters are laden with a history, flaws, likes, dislikes, goals, desires, needs, wants, opinions, and various other personality elements, and even better characters are made with originality in mind. The key to creating a good character starts right in the character creation screen. Something you should heavily consider before beginning is by reading up on the class’s story description. You need to have a strong idea what that class’ role in the universe is, and you have to take full advantage of it, or at the very least, take note of what abilities and weapons they use. A beginning roleplayer could play as a Jedi Knight that trained on Tython to become a member of the Order, or play as a Smuggler who’s job is to smuggle things in and out of the Republic, but that’s unoriginal, and therefore, uninteresting. Instead, consider the possibility of playing as a Jedi who could be a self-trained hermit, a Sith Inquisitor that works in Imperial Intelligence, a Bounty Hunter who is a soldier of the Imperial army, or an Imperial Agent who is a member of the Republic infiltrating the Imperials. The possibilities are quite virtually limitless. The second stage is the actual creation of your character, after choosing their class. Will they be young or old (or in other words, inexperienced, or experienced? A son or a father? An eager and willful young man, or a broken and weathered war veteran)? Male or female (someone’s father, mother, son, sister, brother, wife)? Then what about the easily-overlooked fact of being Human or Alien? The Imperials are a pro-human society that frowns on aliens, so that’s something to also keep in mind. You also should read up on the description of the races too, to learn their customs, language, and culture. Scars are also important, because perhaps scars indicate why a character was given cybernetics, or lost their vision (if you play as a Miraluka, pretending to be a human that went blind). Even hairstyle is important. All of these little details are extremely important, since they visibly show a character’s history and personality in the way they look. This is also how you can start to formulate just who the character is just through the creation of their appearance, so I strongly advise spending a lot of time making your character. Okay, so you’ve created your character and entered the galaxy, but you might not have a full idea yet who your character is yet. That’s perfectly okay, actually. I have a simple solution to fix your problem, and that is to actually play the game. As you quest, you’re going to be making moral choices, especially the light side and dark side choices. It’s through your conversations and how you talk to each character, confront each situation, that you start to realize how your character operates. It can be simply begin by seeing if they’re polite and professional, or cocky and aggressive. You may also be cocky toward some types of people, and professional to others. For example, you could play as a Bounty Hunter who doesn’t like Jawas and the Sith, but he treats his clients with respect and courtesy. You could play as a Smuggler who’s a jerk to everyone except women, or a good Jedi who would favor the military choices for the war instead of focusing on civilians. These are how you’ll ultimately form your character’s personality, likes, and dislikes. The rest of the details will come from the imagination, or maybe you may get ideas from quests you experience along the way for your backstory. However, by under no circumstances should you ever use your class’s actual backstory as your own. This is heavily frowned upon because it’s unoriginal and anyone else can do the same thing, plus it can clash with other people’s backstories. Leave out any and all details you can of your class story when forging your own. The next major ingredient is treating your character as a real, flesh-and-blood, living, breathing person, who have a life outside of your own. You have to really imagine them as a person you could talk to, interact with, swap stories with, and ask for an opinion on things and imagine their answers they would give you. This requires summoning an inner writer from you. Imagine sitting down in a face-to-face interview with your character, and ask how they think, how they feel, how they’d react to something happening, and you have to “listen” and “observe” their response. Ask them questions on what their favorite drink is, their favorite planet, what’s their favorite part of their ship, who do they respect, who their mentor is, who their family is or was, what they do outside of combat, and so on. These will gradually fill in all the gaps and give you a well-rounded character, but one thing you must keep in mind. Like people, characters have strengths and weaknesses, pros and cons, good and bad, and most importantly, flaws. Playing as an all-powerful Sith that can kill everyone and can always get away is an inexcusable character because it’s seen as “godplay.” Your character should never be inherently better than anyone else. They also can’t be the opposite, and be super-tragic characters whom bad things always happen to. This is the part where you really need discipline and restraint, something I’ll cover more of in a later article. 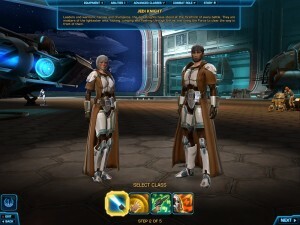 Finally, there’s the matter of playing as characters with high status, even daring to play as the Grandmaster of all the Jedi or the Imperial Emperor, which you should never do. There’s only one exception to this rule, and that’s if it’s a self-contained roleplay between a small group of people, specifically, a guild. Say for example your Guild Master is the Emperor of the Empire. That stays strictly between you and your guild in a large self-contained RP. If a third-party becomes involved, however, you could let them in on this but risk being frowned on, or spin things in a way so it doesn’t seem like it’s not your Guild Master that is the Emperor, and you just be generally vague about it. If you are the one in the Emperor position, then make sure you do well to keep it within your Guild or within the people involved, and make sure you being the Emperor ultimately drives a story forward and not paints you as someone being powerful for the sake of being powerful. Before I wrap this up, let me leave you with parting words: Vagueness is good in Public RP, Details are good in Personal RP. What does that mean? If you’re RP-ing with strangers, keep details, ranks, and specifics to yourself and just use your personality and maybe some of your backstory, whereas if you’re RP-ing with friends and guildmates, that’s where you can share all the details and backstory of your character that you want. Tune in next time where we’ll be talking about Character Discipline and Restraint. Whew! Wow, that was quite a lot today. I can get quite into detail when I work on a Stat Management article. Perhaps I should start singling them out to their own articles. Do you guys think I should do that or keep the large articles I’ve been doing so far? Let me know in the comments bezlow.